Ivation - IVADM35 : Dehumidifier Review • The Air Geeks, reviews of air conditioners, dehumidifiers and air purifiers. Are you looking for a compact humidity control system that runs quietly and it is energy efficient? Well, the IVADM35 is a very quiet thermo-electric dehumidifier that is based on the highly efficient Peltier technology. This lightweight humidity control system occupies small space and it is therefore suitable for rooms with limited spaces. It measures 9.6 x 14.1 x 7.2 inches and weighs 4.45 pounds. If you are looking for a compact dehumidifier that will help you to transform the environment of your house, then you need to consider this unit. In case you have already identified the IVADM35 as a suitable option and you are looking for details about its performance, then we are happy to tell that we have all what you are looking for. We have researched widely to provide you with accurate information that you can rely on to make a firm decision. We have explored its performance, strengths, and even weaknesses. We will start with its features and then explore its strengths and weaknesses. In case you are looking for an energy-efficient humidity control system, then you need to consider the IVADM35. This dehumidifier is based on the whisper-quiet Peltier technology and it is suitable for spaces that are as large as 2,200 cubic feet. It is suitable for bathrooms, bedrooms, laundry rooms, and boats to mention a few. Have you been struggling to eliminate mold and mildew from your house? This unit pulls excess moisture to create an environment that is unsuitable for the growth of mold and mildew. It also protects your valuables from rotting and corrosion. Excess moisture can be a cause of mustiness in your room. This unit captures excess moisture to ensure that your bedroom, bathroom, laundry room, or boat is free from mustiness. Are you looking for a system that can pull a lot of moisture from the air within a short time? Although the IVADM35 is regarded as a powerful thermo-electric dehumidifier, we have noted that it is not powerful when compared to compressor-based humidity control systems. This system is capable of pulling just 1.25 pints of moisture from the air in a day. It is therefore an unsuitable solution for high humidity areas. The IVADM35 features a small bucket for holding the captured moisture. This reservoir has a capacity of 2 liters. What happens when the reservoir is full? To prevent spillage, this dehumidifier is designed to shut off automatically when the tank is full. In addition, this lightweight unit features an indicator light that reminds the user to empty the tank. Most dehumidifiers are known to consume a lot of power. The power requirement increases with increase in capacity. The IVADM35 is designed to consume 72 W making it one of the humidity control systems with the lowest power needs. In case you are looking for a unit that has low power requirements, then this unit may be the right solution for your dehumidification needs. Let’s take a closer look at the pros and cons our reviewers found. Low power requirements. This unit consumes 72 W and it is a suitable solution for people who want to save money. Its impact on your electricity bill is small. Runs quietly. Are you looking for a unit that you can use in a quiet place such as your small bedroom or office? 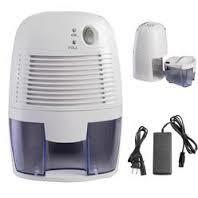 This dehumidifier is designed to operate quietly and does not produce disturbing noises. Incapable of pulling a lot of water. Compared to other dehumidifiers, this unit is weak. It has a very low capacity and pulls only 1.25 pints per day. It is therefore an unsuitable option for high humidity environments. Lacks pumping mechanism. The user has to drain the condensate manually. This system therefore cannot run without requiring regular user attention. Features a small tank. The capacity of its tank is 2 liters. I live in a basement apartment. My window unit AC doesn't drain for some reason, so it gets a bit humid in here. I bought this hoping it could help a bit, and it did. More than just a bit. My couch no longer feels damp, and I can sleep without feeling sticky. I accidently left if off after emptying the tray before I went to work, and when I came home I was shocked at how humid my apartment felt. Turned it back on and a few hours later it felt great in here again. One note, this is not meant for large areas. I live in, essentially, one big room. I think my bedroom growing up was larger than this apartment. So if you want this to dry out a large area, buy two. Or stick with a compressor type, those work just fine. To address a few points found in other reviews. 1. Noise. I can't hear it over my AC. With the AC off, it may be slightly louder than my computer. 2. Overheating power transformer. It does get a bit hot, but I keep it on the same heat sink I use for my computer (a slab of marble) and it never gets more than warm to the touch. 3. "It doesn't work!". Mine works fine, but then I use it as the manufacturer recommends, in a small room. After getting used to having it on, 12 hours without it was enough to convince me that it was a great purchase. 4. "People got free ones to review it". Yep, some people did. I didn't, and I agree with the reviews they gave." I received one of these as a review sample and tested it in my music studio, which is slightly larger than the 2200 cubic feet for which this is designed. The studio is 2304 cubic feet (16x12 feet with a 12 foot cathedral ceiling.) At present I am not using my climate control system because both temperature and humidity are falling. Octobers in Central Florida are like that, so the remaining relative humidity without my climate controls is sufficient to test this unit. The water capture is close to the full twenty ounce capacity every three days, so this dehumidifier is definitely working. It's very quiet. So much so, in fact, that I need not turn it off when I am practicing in my studio. I have not attempted any recording while this is operating, but I doubt if mics would pick it up anyway. Operationally it's relatively inexpensive to operate because it only consumes 72 Watts - less than a typical light bulb. My main purpose is to keep the relative humidity in my studio at a constant level during the winter months to protect my electronic gear. I am planning to add an acoustic piano, and this will definitely help keep that in tune as well (I plan to also use an internal dehumidifier designed for pianos to ensure that.) My personal use of this device solves a very specific problem. I have a different model in my guest bathroom that has been chugging away for over a year and it, too, has made a lot of difference. I love the fact that these are small enough to use in single rooms, and inexpensive enough to operate that the effect on my electric bill is nominal." The Ivation IVADM35 is a compact dehumidifier that is based on the highly efficient Peltier technology. This unit is suitable for very small spaces because it has low capacity. It is energy efficient and it is optimized for a whisper-quiet operation. In case you are looking for a high capacity unit that can draw a lot of water from the air within a short time, then you need to think about another dehumidifier. Apart from having a low capacity, this unit does not offer an alternative drainage option. The user has to empty the tank manually. We are so-so about this unit, in spite of its admittedly very low price.